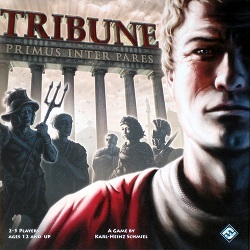 Tribune is one of those great games that I always forget how much I like until I play it and then I silently (and sometimes not so silently) wonder why it doesn’t get played more frequently in my house. Tribune has the feel of a much more complicated game but it’s actually surprisingly simple. There’s just a lot of different things you can do in a round giving the new player a false impression of extreme difficulty at first. Once you understand the turn structure and the different spots on the board, it’s surprisingly easy and really fun. 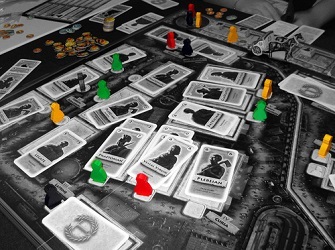 **Pictures are all snagged from BoardGameGeek.com’s Tribune page. The basics: Players place followers on the board to gather faction cards which help meet objectives and, hopefully, take over factions. The player with the highest total for a single faction will take over that faction and gain its special benefit(s). Your hold over that faction can be usurped by another player if they can play a higher hand total of faction cards than you. Your ultimate goal is to meet a specific number of objectives, aka “Victory Conditions”. There are six possible objectives and how many you need to meet to win is based on the number of players. The strategy: Knowing what you have, and gauging what your opponents want, is key to Tribune. 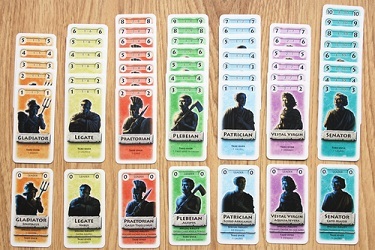 There are 8 regions on the board to get cards – Thermae, Forum Romanum, Latrine, Curia, Atrium Auctionorum, Catacombs, Pantheon, and Field of Mars. There is also the “Coin Bowl” and the “Faction Fields”. Players place followers one at a time in a clockwise pattern. If you place in the coin bowl, you immediately take denarii. After all followers are placed, cards are gathered. Each of the card regions has its own rules – some are easy to get cards from (ex: pay 1 denarii or discard 2 cards of the same faction). Others are more of a crap shoot (ex: the Atrium requires you to bid against your opponent if someone ends up on the “2” space). Since space at each card region is limited, turn order plays a big part in who gets what. Why I lurve it: There’s definitely a competitive spirit to this game. For some reason, everyone likes fighting over the Vestal Virgins when I play. I wonder why? 🙂 I really like that there’s no dice rolling and fairly minimal bidding. It’s all about managing your hands and maintaining control over your factions in order to earn those victory conditions. Once you know how to obtain cards from each region, it’s actually very simple to play. Tribune just looks crazy complicated because there’s a lot going on. Flip through a PDF of the rule book here.